Why the links on the PDF can’t work after converted to Flip-Book on MAC? 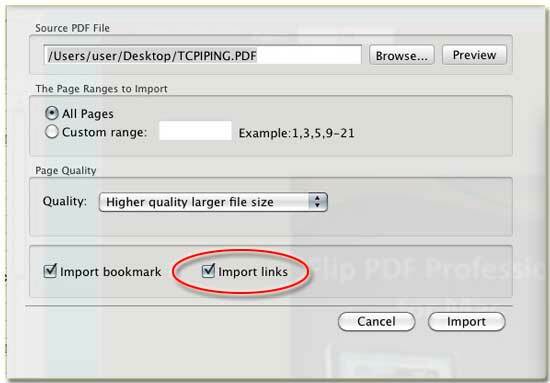 You would encounter this problem the links on the PDF can be easily skip among its pages but after you convert the PDF to flipping catalog for online publishing it isn’t valid anymore. You almost have no solutions about this issue because it is just so veiled that you almost can’t find why. FlipBook Creator Pro for MAC of course allows you to import links and preserve them valid, please follow the below easy steps. Step1: Launch FlipBook Creator Pro for MAC, and click the top-left icon of Import PDF. Step2: Move eye sight down to the area of checkboxes, check Import Links. Once you check it, all the links in the original PDF will be preserved valid. Although It is converted to flash flipping catalog, you click the links on any flipping page, the link can easily direct you to the specific page immediately.